Rad group’s success may hinge on communication with the hospital. Radiology practice models run the gamut from hospital-employed radiologists and imaging facilities to various contract models, including exclusive, nonexclusive, and no contract. Contractual arrangements can cover medical and/or medical and administrative aspects of radiology practice. It is also no secret that radiology market trends involve increasing competition as more hospitals evaluate teleradiology groups, national radiology groups, employee models, and other nontraditional options. In this current climate, radiology practices need to reconsider their business model and especially their hospital relationship(s). Tightening regulation and reimbursement paired with increasing competition are pushing imaging toward greater consolidation and larger organizations, veering away from traditional smaller radiology practice models. This new direction includes emerging relationships between teleradiology groups and hospitals, competitive hospital contract bids, and the independent formation of radiology groups. Many radiology practices will need to find new ways to position and run their practices in the future, leaving some past standards behind. • the practice’s attitude toward its hospital(s). The evolving imaging marketplace has not necessarily created the need for a completely new model but merits considering adjustments to the current design. There are real differences between a radiology practice and most businesses, each having its advantages and disadvantages. Some of those key differences are listed in the sidebar. Looking at the group practice structure, physician owners are intuitively connected to their service offering but also can be dangerously democratic, with owners doing what they choose with little concern for the practice as a whole. Some practices may not offer a high-quality service approach because some partners don’t see it as a priority. Multiple voices can also muddle the practice’s goals and create confusion. In some practices, employees do not deliver quality compared with the practice owners, but those employees are often hard to remove. In a clinically driven practice model, it’s often difficult for physician leadership to drive consistency among employees and even partners. The private practice model may not need to be replaced, but often the group needs to shift its focus to consider the hospital relationship its greatest priority. • Impeccable service: What radiology practices must remember is that great clinical skills get them to the table, but great service keeps them there. Practice leaders are charged with the task of creating and running a service-centered business entity. • Supportive approach: Practices must find ways to effectively support the hospital relationship. This may include improved governance, communication, relationship management, and control of the deliverables—all of which benefit from motivation to achieve a broader shared goal. • Performance standards: Hospitals seek quality, consistency, and a desirable public image in their customer service efforts, paired with the ability to uphold performance standards with increased coverage hours. These standards are difficult to align with radiologists’ wants—the desire for steady incomes and certain vacation levels, maintaining improved exclusivity clauses, having more technical ownership, and offering nighthawk coverage with reduced weekend coverage. The differing needs and wants of each party make it difficult to create common goals, often leading to dissatisfaction on both sides that then causes the relationship to suffer. • Common ground: Focusing on common ground can provide a smart solution for a relationship disconnect between radiology groups and hospitals. If hospital and practice leadership put forth their best efforts to maintain and discuss areas of common ground—patient service, hospital viability, strategic direction, technology, leadership in the radiology department, and community leadership—those discussions can provide points where collaboration is more likely and the relationship can be improved. The issue of contracting often stifles the relationship and generates conflict; reaching some common ground on other issues may help both sides deal with more difficult contracting issues. There are collaborative efforts that radiology practices and hospitals can undertake to assist one another. Radiology practices can help provide the customer-focused service the hospital demands, focusing on the needs of the referring specialists and generalists who work at the hospital. The hospital also needs an in-depth understanding of the market in its current and future service area. The radiology group medical director can analyze and share some financial and operational information from the radiology practice, such as recruitment and joint venture opportunities, while also keeping an open mind regarding the group paying for some of its services provided by the hospital. Understanding hospital plans can help radiology groups better map their future, too. Aligning with the hospital is crucial to the growth of the radiology practice. Once a practice has firmly established that it is willing to help the hospital meet its needs, it should seek out various levels of service execution, new sources of revenue, and growth for its distributed reading business, keeping in mind financial security and any associated risks. 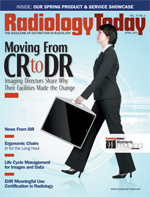 Radiology practices may not need to completely redesign the existing radiology practice model to survive, but groups that can shift their strategies and tactics to focus on the hospital relationship through alignment and collaboration on shared goals have a better chance of ongoing success in the evolving imaging environment. — Randy Roat, CHBME, is vice president of radiology services at Medical Management Professionals, Inc.